On a ride around the neighborhood the other evening, this emerging piece of yard art caught my attention. A couple of days later I met the homeowners who thought of it and the chainsaw sculptor who’s making it real. Troy and Tami Allender moved to the Palestine area of North Albany three years ago from Myrtle Creek. An abscess on his spine has Troy, a former trucker, using a wheelchair, and the house on Oak Grove Drive appealed to them because it was already equipped for wheelchair access. The power company came along and told the homeowners a dead Douglas fir out front had to go because in a storm it might hit the lines across the road. 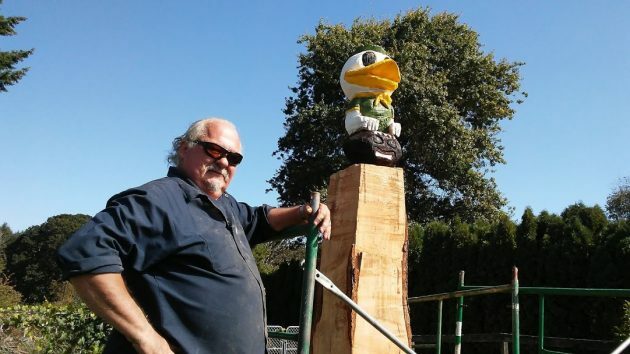 The Allenders had it cut 12 feet from the ground, leaving enough wood for what Troy envisioned as a totem dedicated to Oregon Ducks football. Originally from Southern California, Doug was a hockey fan, he told me. Watching Oregon play football on TV turned into him into a fan of the Ducks. 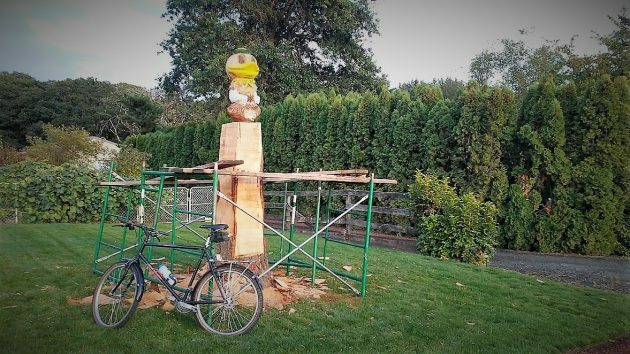 Troy went online and found someone to carry out his idea for the stump in their front yard. 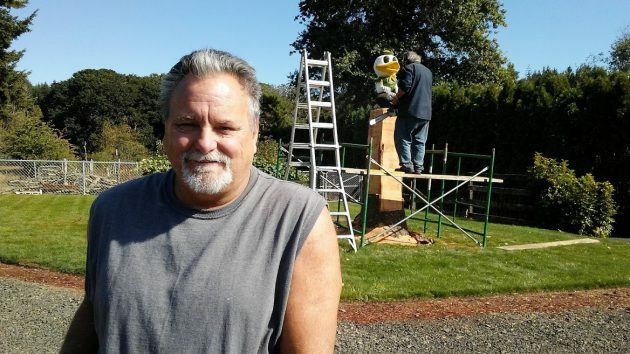 The man he found is Patrick Flanagan, a chainsaw carver and sculptor by trade, with a shop in Lebanon. On Facebook, you can see dozens of his works, including some made from stumps as in this case. Patrick Flanagan pauses Tuesday before getting back to work on his artwork. Watching Oregon play on TV turned Troy Allender into a Ducks football fan. Will that black football that the Oregon Duck is looming over soon be orange and black? If so, Mr. Allender will find out soon enough which neighbors are Beavers fans and which are Ducks fans.